« Crazy Generation and Some Hot Days!! Not too much I can say about the weather except HOT!right now it is 98 degrees. Tomorrow will again be in the 90s, but next week looks like mid to upper 80s. Yeah! This past week they fired up all four generators several days.Monday it hit 14,000 cfs, Tuesday was almost 11,000 cfs and Wednesday and Thursday almost 13,000 cfs. That’s a lot of water. Last Tuesday, Stan took Bob from Michigan out for possibly a full day trip. With the projections on generation as high and coming on as heavy as they have been, we don’t guarantee a full day. Why spend all that money. We just come off early and adjust for the time. Why burn up and have hard fishing if you don’t have to? They had a descent day on the holographic green crackleback. Frances and her son, Elliot, booked a full day float with Carolyn. Again, due to the bad water, we opted to turned it into a half day. These two had fly fished a little before and caught fish on a white San Juan worm, a cerise San Juan worm and the holographic green crackleback. They both liked stripping the crackleback. Jim had Jack and his grandson, Zac out for half a day. This was Zac’s introduction to fly fishing so Jim spent a lot of time working with him on casting and line management. 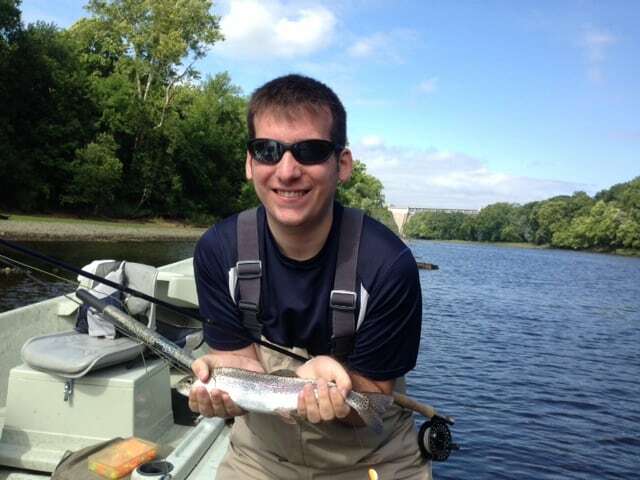 They also fished with Jim most of the following day. Best patterns were the CQ streamer, black zebra midge and a gray scud. Stan had Walt and his son, Payton out on Wednesday afternoon for a half day. This was the worst of all conditions….hot, water ripping. Unfortunately, other commitments only allowed this window for them to go fishing. They brought in a few fish on the cerise San Juan worm. Thursday, Carl and Paul spent half a day with Jim. It was the CQ streamer and a black zebra midge for these guys. Not a bad day. 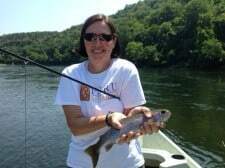 Carolyn took a family of three out for an instructional wade trip with catching a few fish a bonus. After going through the paces of roll casting, the regular cast, and a little on all the “stuff” you need to fly fish such as leaders, tippet, flies, indicators, fly line, etc. we headed out to learn a little on presentation. It was a P&P day although two of them caught fish on the crackleback when we worked on stripping. 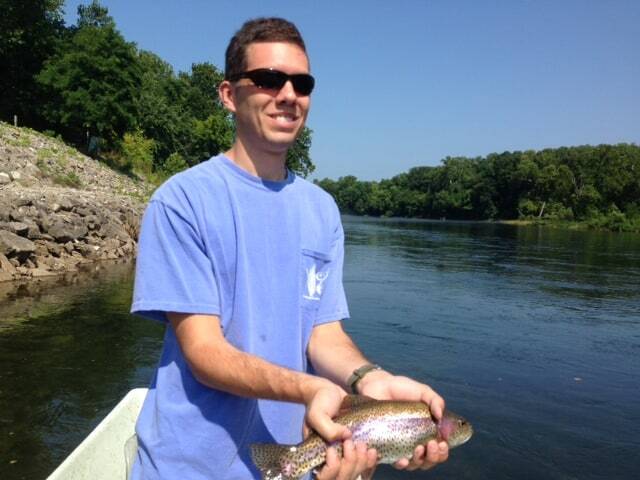 Kyle was the first one to land his first trout on a fly rod. Dad, Bob, was the second. 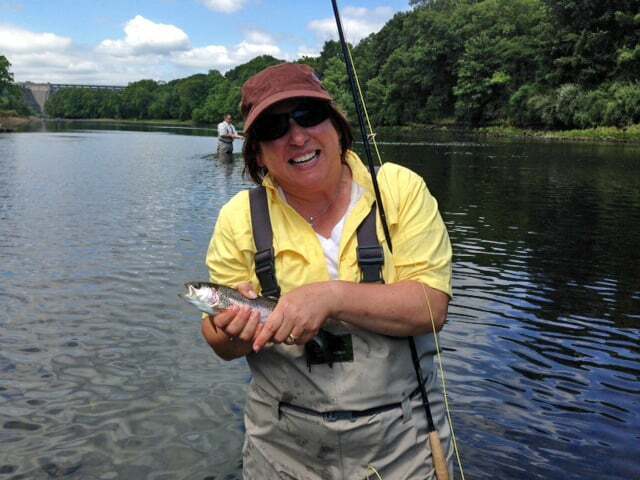 At last, Kay caught her first fish on a fly rod. While Carolyn was trying to get it in a position to hand to Kay to take a picture, Kay had cast her fly back into the water and hooked another! Chaos for a few minutes. Needless to say, we lost her first fish, but did get a picture of her second fish on a fly rod! Stan had Jeff and Sam out for half a day on Thursday and a full day Friday. They had a fun couple outings on the copper dun and P&P midges in the morning, then the holographic green crackleback in the afternoon Friday. Hot day!! 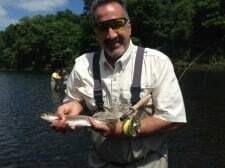 This entry was posted on Saturday, July 26th, 2014 at 2:35 pm	and is filed under Fishing Reports. You can follow any responses to this entry through the RSS 2.0 feed. You can leave a response, or trackback from your own site.